A fifth issue doesn’t seem like it’s that far into a series…but in the "meta" sense of this being 25 years old and well over two decades between the END of this series and the present…the series didn’t quite make it 25 issues. 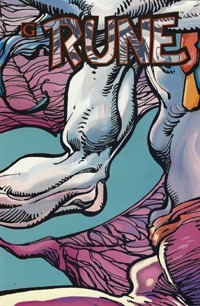 But even at 25 issues…this would put us 1/5 through the series now! That’s both discouraging in that the series had such a brief run, but encouraging to notice we’re getting into the meat of the thing, past the most initial of setup and foundation-laying. We saw the origin–the lightning bolt/Jumpstart that hit the cable car. 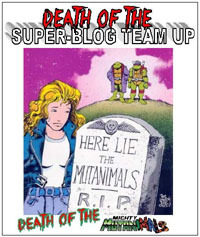 We saw the characters come together, and saw them investigate Yrial and wind up with her the "final member" of the team; saw the team take on TNTNT, their first actual "supervillains" ("ultra-villains"), as well as meet up with Hardcase and have that adventure. Now in this issue, we see the team–after "most of the series" so far–spit up to go back to their own individual lives. Bob Hardin (Atom Bob) visits with his parents and sees the crowd camped out at their house for a glimpse of him. Leon Balford (Zip-Zap) returns to his street and puts a bully in his place. Hugh Fox (Grenade) and Candy (Electrocute) view his house–overrun with media folks and such, and head off, discussing their status quo, having a "moment." Elena La Brava (Lady Killer) works the phones on coverage of the team. Yrial takes to a rooftop, frustrated firstly with being "forced" to join the team, and secondly with having no place of her own to go when the team split to go their own ways…but soon spots trouble and prepares to page the rest of the team to regroup. Finally, David Castiglione (Spectral) visits someone in the hospital, and after catching up a bit, he tries to use his healing power. If he could heal a broken arm, surely he could heal this! The scene shifts and we find the rest of the team back together and wondering where Spectral is. They decide to proceed without him, and find Deathwish…who is not at all like the frail old man he "grew from." The Strangers launch into battle, but none of them can take the villain. Eventually Spectral shows up in his green-flame form and lays into the villain…emerging victorious. As things wind down, the team reflects on his action–they’d focused on trying to deny Deathwish any further power, while Spectral gave him more than he could handle. Realizing David’s effectiveness was part anger and venting, they probe a bit and discover that he was unable to heal his partner. They hadn’t realized he was gay, but the fact of it is simply matter of fact and casual…no more a focus than Hugh being attracted to Candy. I really enjoy issues like this. Maybe it’s that I’ve been reading comics for nearly three decades, but seeing superheroes in action is such a "given" and seeing much of what they do out of costume or out of action is a relative rarity…so seeing a bit of focus on each of the characters reminds us that they’re individuals, gives us a fresh glimpse into their private lives and background, and generally fleshes them out and builds the individuals in a way that doesn’t work easily when they’re all together and being juggled in an action sequence. I often lament the drawn-out/padded-out nature of modern comics written for the 6-issue trade…and even though we’d had very brief foreshadowing bits in earlier issues for Deathwish, essentially he just shows up in this issue, is fought, and defeated–all in one issue. And that’s in addition to getting scenes of each of the individuals on their own…once again packing into one issue what could easily be drawn out to at least 5 or 6 issues in the present (if not 7 or 8 to give each Stranger a solo issue…and even as a single issue, a modern take would have at least 8-9 covers for this issue to give each character a cover, plus the cover we have, plus maybe a glow-in-the-dark Spectral cover on top of that). Visually this is another strong issue, with all the characters seeming perfectly familiar, and quite consistent with the earlier issues…same artist, same quality and all that. The only thing that really stood out to me was the page split with the Strangers seeing Deathwish the first time…there seems to be a lot of different coloring effects going on with lighting and such that actually prompted me to go back to the credits to see if someone else had contributed a page. It has an almost painted sort of look to it, different from the usual colors of the rest of the issue. I’m sort of surprised–we have our third in-sequence chapter without a great leap in time. This picks up the day after the bitterly disappointing discovery that even Edwin’s power wasn’t enough to permanently restore Rune to his former glory. This chapter picks up the next day and we see that Rune has killed a drunken homeless person…but the alcohol in the guy’s blood is poisoning Rune himself. As a storm rolls in, Rune flies into the sky to be struck by lightning–or perhaps calling the lightning to him–to purge his body of the poison, though it can’t purge the cancer that eats away at him. This being another 3-page segment of a single issue-length story, the art is consistent as expected with previous chapters, as it’s the same creative team as those earlier chapters. There’s not a lot of room for development or continuing story, but this shows us that while Rune might have trouble taking down anyone more powerful than a powerless human, he can still survive (and even thrive from) a lightning strike! His magical/sorcerous power is still there, even if he lacks the physical might he once had. And this does show his growing desperation, which likely makes him all the more dangerous! As with the other Rune Month issues, this is one that is easily identified as a Rune Month (October 1993) issue, but the Rune chapter alone does not give cause to seek it out as a single issue. 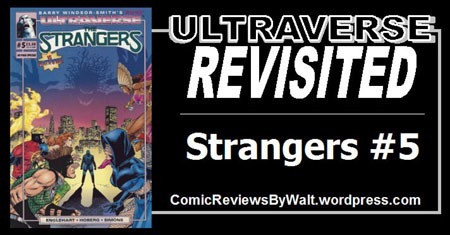 However, for the Strangers portion…this SOMEWHAT stands alone. It doesn’t in itself give much exposition or backstory, but if one is loosely familiar with the characters, this would not be a horrible issue to get on its own. The cover is at once a bit bland to me, yet over-promises on Deathwish and his power. Sure, the character was a bit imposing and wielding a very dangerous power…but he was hardly holding sway over an entire city, nor much mystery to the team as to his identity. This cover would seem more fitting to me as the cover to a collected volume of a several-issue story against Deathwish or of multiple encounters with the character. The blurb "Vs. Deathwish" seems tacked on and somehow just LOOKS "’90s-ish" and seems far too symmetric…so basically showing off then-new-ish stuff done with digital elements for the cover. This is well worth getting from a bargain bin, though as many times as I’ve seen this and other early Ultraverse issues in 25-cent and 50-cent bins, I suggest as with those not to go much over $1 for this issue if you seek it out.